The new pyrometer PYROSPOT DGEF 11N has an Y-fiber cable and a laser target light. It measures temperatures starting at 100 °C. Very hot environmental conditions and difficult to reach measuring points make particularly high demands on the industrial process measuring technology. Pyrometers with fiber cable of the PYROSPOT series 11 from DIAS Infrared for non-contact temperature measurement are ideally suited for these demanding measuring tasks due to their small, robust optical head and separate electronic box. 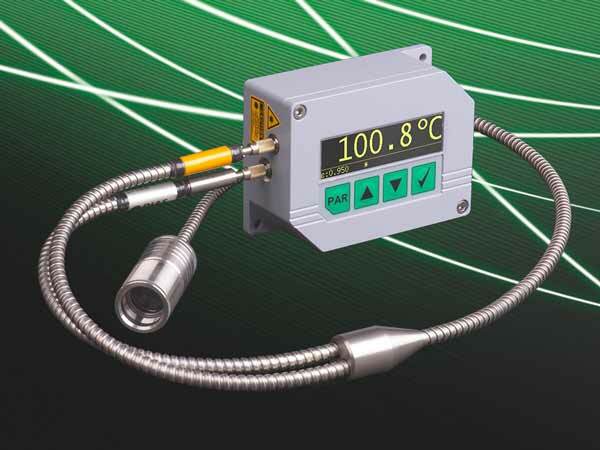 The optical head allows ambient temperatures up to 250 °C without additional cooling. Based on state-of-the-art extended InGaAs photodiodes, the DGEF 11N type is manufactured within the PYROSPOT pyrometer series 11, which enables non-contact temperature measurements from 150 °C to 1200 °C in a spectral range from 2.0 μm to 2.6 μm. The electronic box has a large, easy-to-read OLED display, keys for parameterization, a 0/4 to 20 mA temperature linear output and an RS-485 interface (Modbus). With an integrated laser aiming light, the pyrometers can be accurately aligned with the measured object. From now another temperature measuring range from 100 °C to 800 °C (wavelength range 1.5 μm to 2.2 μm) is available for the device type DGEF 11N. This is possible by the use of a special optical multi-fiber. Contact our sales engineers if you have any questions.